The collision of politics and tabloid culture hit a surreal crescendo in the hours before the second presidential debate, with embattled Republican nominee Donald Trump seeking to deflect and distract from video evidence of his treatment of women by dredging up Bill Clinton's past. What many feared might be the first debate to require a seven-second delay, however -- "The Presidential Debate Show," a not-ready-for-primetime special that would flummox satirists with its absurdity -- quickly settled into an identifiable pattern. And it was a pattern that mercifully wasn't the "disaster," to use a favorite Trump term, that it had seemed it might be. Part of that had to do with the fact both candidates came into the evening with very clear strategies. While Trump scored some points with tart one-liners, many of his stylistic aspects during this town-hall setting were off-putting and awkward, from the way he uncomfortably paced the stage (at times standing right behind Hillary Clinton); to once again frequently sniffling; to his real-time pouting about being abused by the moderators, grumbling, "One on three." 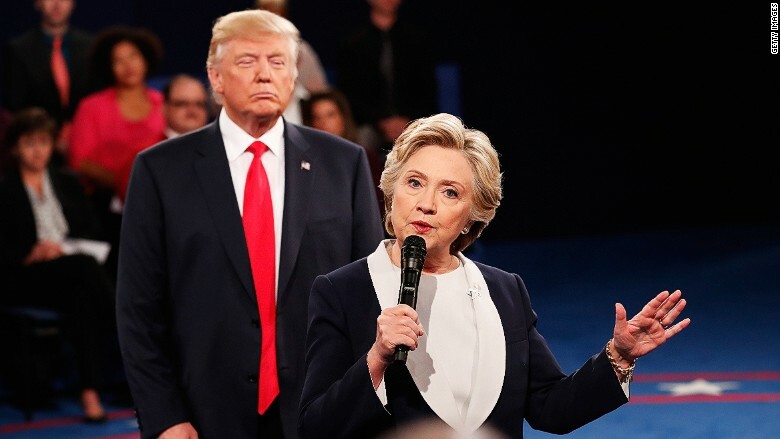 Strategically, after a low-energy start, Trump appeared determined to relentlessly attack Clinton -- to the point of saying when he was president she would be in jail. Clinton, meanwhile, sought to preemptively tar her rival by quoting First Lady Michelle Obama in saying, "When they go low, you go high." Trump's criticism notwithstanding, the real winners of the night -- to the extent any journalist can "win" in such a highly partisan climate -- were the moderators, CNN's Anderson Cooper and Martha Raddatz. True, the town hall format provided Cooper and Raddatz some cover from the fire previous moderators have come under. But their willingness to press the candidates to answer the question -- as opposed to letting them deviate into those topics they wanted to discuss -- was both refreshing and welcome. Setting politics aside, Trump's aggressive, occasionally belligerent approach might have helped him get through the 90-plus minutes, especially in light of how much on the defensive he was after a weekend of bruising media coverage. Yet once again, several of his statements figure to have a long tail. These debates are not just about the night on which they are held, and the key moments of them can't be divorced from the attack ads and Monday-morning quarterbacking they'll produce. Specifically, Trump seemingly confirmed the New York Times report that suggested he hadn't paid federal taxes in close to 20 years; disavowed a statement by his running mate, Mike Pence, eliciting overt surprise from Raddatz; dismissed his videotaped comments about women as "locker room talk," before changing the subject; and again interrupted Clinton -- who did her best to look serene while Trump spoke -- multiple times, compelling Cooper to admonish him. Cooper and Raddatz did manage to touch upon a multitude of topics, including a few -- like climate change, albeit somewhat peripherally -- that were omitted or given short shrift at the prior presidential and vice presidential debates. The amount of time devoted to policy was something of a relief, given the circus-like build-up and initial portion of the debate devoted to Trump's "Access Hollywood" video and his reference to the Bill Clinton accusers with whom he had appeared. Again, all this might be grading on a curve. Before the debate, an almost palpable sense of dread infused the pre-game chatter, which MSNBC's Brian Williams accurately summed up as "genuine tension, with a dark tinge." Given that apprehension, the debate wasn't a disaster, especially for the moderators. But, sadly, going high was still too much to ask of a debate in a campaign that has so often gone low.